This past Christmas, my Dad and I got my Mom a tabletop studio set-up for product photography. I decided to give it a quick test run when I saw my old chess set, which I had posted about previously. I never took proper pictures of the set back in 2000, so it was long overdue. 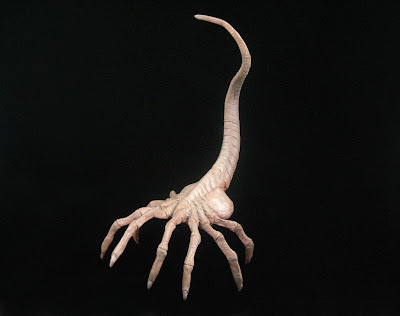 The face-hugger is made of elasticlay, a type of sculpey that cures, but doesn't harden when cooked. It has a galvanized steel skeleton and remains bendable to this day. 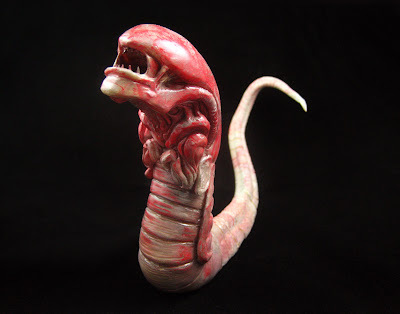 The chest-burster above has a tail made of elasticlay, but the main body is super sculpey. And those teeth? Truncated pushpins.